That's how White House chief of staff John Kelly refers to his boss, President Trump, according to an explosive new book written by famed journalist Bob Woodward, most known for being one of two Washington Post reporters to help take down the President Richard Nixon administration due to his digging during the Watergate scandal. "It's pointless to try to convince him of anything. He's gone off the rails. We're in crazytown," Kelly is quoted as saying about Trump in Woodward's new 448-page book, Fear: Trump in the White House. Kelly added, "I don't even know why any of us are here. This is the worst job I've ever had." Both the Washington Post and CNN obtained Woodward's book ahead of its Sept. 11 release and published excerpts on Tuesday morning, revealing the chaotic nature of President Trump and a staff attempting their best to protect the country from his dangerous and impulsive commands. Robert Costa, who first reported the excerpts for the Washington Post, said Woodward paints a "bleak portrait" of a president who is at odds with his own aides and fumes constantly about special counsel Robert Mueller's investigation into Russia's meddling during the 2016 election. "Woodword uses the phase nervous breakdown. He talks about an administrative coup d'état," Costa said on MSNBC Tuesday afternoon. "You see an administration that's struggling to contain and guide their own president. Reluctant to say anything publicly, but privately going so far as to take trade agreements off his desk." Despite calling Woodward a "fair" reporter in an audio recording of a phone conversation back in August, the White House issued a statement claiming without evidence the 'book is nothing more than fabricated stories.' Kelly also denied calling President Trump an idiot, calling Woodward's account "total BS" and "another pathetic attempt to spear people close to President Trump." KELLY: “The idea I ever called the President an idiot is not true." Ari Fleischer, who served as George W. Bush's press secretary from Jan. 2001 to July 2003 and is currently a Fox News contributor, was featured in Woodward's Bush at War, his first book about the Bush White House. 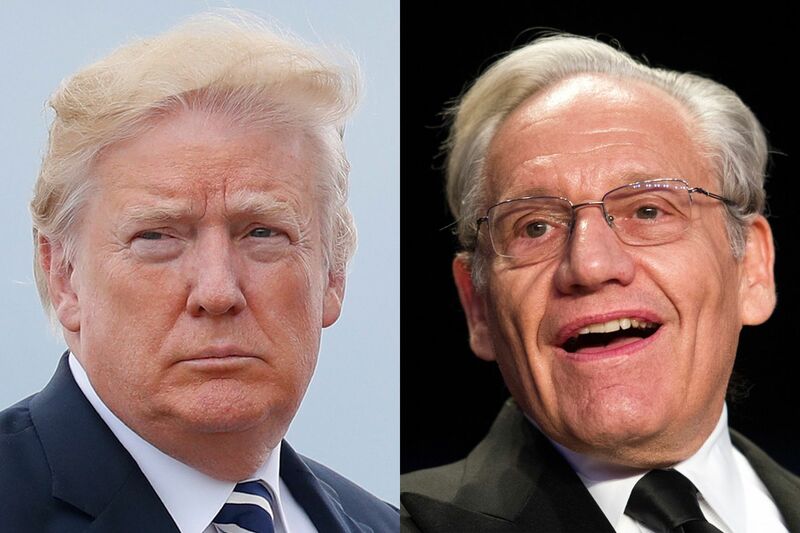 Fleischer said despite Woodward's generally negative portrayal of the White House and the wars in Iraq and Afghanistan, the longtime journalist had all his facts straight. "There were quotes in it I didn't like. But never once – never- did I think Woodward made it up," Fleischer wrote. "Anonymous sources have looser lips and may take liberties. But Woodward always plays it straight. Someone told it to him." I've been on the receiving end of a Bob Woodward book. There were quotes in it I didn't like. But never once - never - did I think Woodward made it up. Anonymous sources have looser lips and may take liberties. But Woodward always plays is straight. Someone told it to him. Here are six explosive excerpts from the book that have been posted so far. According to Woodward, Defense Secretary Jim Mattis was alarmed after a meeting in January where Trump questioned the country's military presence in South Korea, including a secret intelligence operation that allowed the U.S. to detect a North Korean missile launch in seven seconds. "We're doing this in order to prevent World War III," Mattis told Trump, according to Woodward. After the meeting, Woodward writes, "Mattis was particularly exasperated and alarmed, telling close associates that the president acted like — and had the understanding of — 'a fifth- or sixth-grader.' "
Among the most explosive claims in the book is that John Dowd, Trump's former personal attorney, was so convinced the president would perjure himself during an interview with Mueller that he staged a practice session with the president, which he later reenacted in front of Mueller. According to Woodward, Dowd told Mueller, "I'm not going to sit there and let him look like an idiot. And you publish that transcript, because everything leaks in Washington, and the guys overseas are going to say, 'I told you he was an idiot. I told you he was a goddamn dumbbell. What are we dealing with this idiot for?' "
The subject reportedly came up with Trump again the day before Dowd submitted his resignation. "Don't testify. It's either that or an orange jumpsuit," Dowd told Trump, according to Woodward. "You are not a good witness…Mr. President, I'm afraid I just can't help you." It's no surprise one of Trump's targets in the book is embattled attorney general Jeff Sessions, whom the president has belittled publicly for more than a year. But according to Woodward's new book, Trump told former White House staff secretary Rob Porter that Sessions was a "traitor" for recusing himself from overseeing special counsel Robert Mueller's investigation into Russian interference during the 2016 presidential campaign. "This guy is mentally retarded. He's this dumb Southerner," Trump reportedly said, mocking Sessions' southern accent. "He couldn't even be a one-person country lawyer down in Alabama." During a dinner that included Mattis and Joseph F. Dunford Jr., the chairman of the Joint Chiefs of Staff, Woodward writes that Trump falsely claimed that Sen. John McCain, R., Ariz, was given an early release from a Vietnamese prison because his father was a prominent Navy admiral. "No, Mr. President, I think you've got it reversed," Mattis reportedly said, noting that McCain actually refused to to be released as a POW until his fellow prisoners were freed, leading to five more years of brutal torture. "Oh, okay," Trump replied, according to Woodward. Following the deadly violence that broke out during a white supremacist rally in Charlottesville last year, Trump was widely criticized for blaming "both sides." The outpouring of criticism actually forced Trump to clarify his comments and condemn white supremacists and neo-Nazis in a speech from the White House. But according to Woodword, it was a speech Trump regretted almost instantly. "That was the biggest f– mistake I've made" Trump said according to Woodward, adding it was the "worst speech I've ever given." The book reportedly opens with former chief economic adviser Gary Cohn stealing a letter from Trump's desk that the president intended to sign that would have withdrawn the United States form an important trade agreement with South Korea. Cohn reportedly did something similar to prevent Trump of pulling out of the North American Free Trade Agreement, better known as NAFTA. "I can stop this. I'll just take the paper off his desk," Cohn told Porter, according to Woodward.